Sam - re what Tarbev is saying about pushing yourself too hard. Peter's experience is that he needs to judge very carefully how much he can push himself. When you say you hurt - do you mean that muscles are sore/tight? Or a different sort of pain? I ask because Peter finds that yes - he needs to push a little - but if he pushes too much his muscles react by getting tighter - which has on many occasions pushed him backwards. In 6 years it's been a really slow process. He inches along but on the occasions where he has got a bit gung ho and done too much he has taken weeks and a couple of physio sessions for his spasticity to return to it's usual levels. He is never without tight muscles completely though at the end of a neuro physio session where they work on relaxing and stretching he can get close. The physios tell him that under the spasticity he has decent muscle strength. Often he finds he can do something OK but the following day his spasticity pays him back for it. He always has a little kick back after exercise but if he judges correctly it will disappear in a day or so. He gets very frustrated with this sometimes - like you he is keen but has to temper his enthusiasm. But the overall improvement is upwards - he continues to improve, but with setbacks along the way. Are you taking a good break between sessions for your muscles to recover? Peter finds that 2 or 3 sessions at most a week are all he can do. With at least a day's break after each one. The physios back him on this. Of course - you may be different - everyone is but I thought I would offer Peter's experience. Also as Tetra says - sometimes it's not the SCI that is causing the problem. He recently had even more than usual hip pain and although his muscles in that area are very tight and cause discomfort it turned out that he has some arthritis in his hips and it is adding to the pain - so he had a steroid injection which helped. Also the pain increase he is currently experiencing in his ankle seems to be due to ankle pronation - he is waiting for an arch support (foot orthotics) to (hopefully) sort that one out. PS - in patient rehab (in the UK) did little for Peter. Sounds like you have more/better facilities for rehab in the US. that's one reason I stopped going to pt because they had me at an orthopedic pt place which is not correct, so I decided to go on own. they knew it but did nothing to change. the hurt is muscle related, probably pushing myself too hard. money is very tight, so hiring a pt personal isn't an option for me. still trying to get used to new limits in body also, pushing too hard is most likely the reason. I think I need to go every other day working out instead of everyday like peter, we seem to be similar, muscles sore/tight/tired. some days feel fairly strong and others weak. I feel strongest usually after a days rest. just tired of the daily discomfort and pain that goes with this sci. one issue I have is edema in left ankle and foot and its very fragile and cuts easily, so I am constantly dealing with oozing cuts on left ankle because of very sensitive and fragile skin, ooze is clear. sam, for the edema and oozing,...please look up “liver flush”. PM me if you don’t see the connection. sam , for the edema and oozing,...please look up “liver flush”. PM me if you don’t see the connection. I took dantrolene for 2 yrs before stopping about 1 yr ago, I know its bad for liver and I was on a pickline for 12 wks taking heavy antibiotics in hospital which isn't good for liver either. is that what is causing my issues? please explain or send link to explain on youtube. Peter has 2 physios and one of them has a favorite saying "less is more" for SCI. She does Feldenkrais with Peter which is small movement and connections. One thing she suggests for Peter which you could maybe think about for your non workout days is just lying on the bed in a comfortable position and thinking about your body - consciously trying to relax the muscles and thinking about how your foot is connected to the ankle and ankle to the leg bones, - etc etc. She is strong on neuro plasticity and believes that your body can often relearn to do something by using your brain and thinking about it. Peter is more of an action type of person and finds this hard - but he is trying and if nothing else he manages a nice nap in the afternoons. sam, I don’t think you’ll mind if I over-simplify. 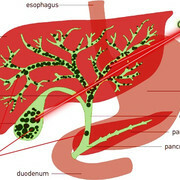 Basically, toxins and waste are eliminated from your body via gallbladder > bile > bowel action. They are also eliminated via kidneys > urine. But if you have gallstones slowing down the work of the gallbladder, then all those excess toxins have to be handled by your kidneys. Poor kidneys. They are doing the best they can for you, but they just can’t keep up. They weren’t made to do it all alone. If you do a liver flush, you will get rid of all those stones and sludge in you gallbladder, bile will flow freely again, and this will allow your kidneys to do what they do so well. This is the only way your foot swelling (edema due to renal insufficiency) will go away. well that definitely makes sense, is there a liver cleanse you prefer that would be effective for me?? Liver cleanses are good. But, sam, it isn’t a liver cleanse that I’m talking about. It’s a liver flush. It isn’t a diet that slowly cleanses the liver. I did the liver flush every six months pre-injury. It’s a process that takes about a day and a half for non-sci people. But now, due to my slow bowel elimination, the liver flush takes me two and a half days. A person must have an empty stomach and bowel before drinking lemon juice and olive oil. It must be drunk (all at once) at night, and you must immediately get comfortable and go to sleep. The stones will be expelled while you sleep. Stay home the next day for elimination. You’ll feel like a new person. Here is one description of how to do the liver flush, but there are many other variations. Move about halfway down the page at this link to see the actual schedule that you would follow. Look for the heading, “Liver & Gallbladder Flush Schedule”. A liver cleanse cannot duplicate the benefits of a liver flush. There are many things that you can do for yourself in anticipation of the liver flush, preparing for it so as to have the best results. The above link will tell you all about it. Also, in your case, the kidney cleanse tea would be a good idea before doing the liver flush. vintage, I need to do but worried about diarea, I have trouble getting to toilet wo diarrhea so it scares me. maybe I should start with slo cleanse first? The diarrhea from taking Epsom Salts is absolutely necessary for the liver flush. I can’t stand up at all, so for me it’s even more difficult than for you. Nevertheless, I did three liver flushes while in nursing homes. It was both physically and emotionally stressful for me, because the aides saw “diarrhea!” and wanted to give me Immodium. I knew they wouldn’t understand. All I could do was refuse the Immodium. But there was one kind and intelligent male nurse who actually squeezed my lemons and made juice for me, to help me do my cleanse. Bless his heart. Yes, getting to my “toilet place” and cleaning up after myself is the most difficult part of the liver flush, now that I’m SCI. But getting rid of my gallstones was lifesaving for me. I had panceatitis from when the car hit me, and the liver flush has gotten me to the place where I can eat almost normally,...while others are going to hospitals, having stints implanted, eating no fat for the rest of their lives, and having their pancreas removed and pancreas cells transplanted to their liver. Ugh. The better choice was clear to me. It takes guts to do a liver flush. Sure, start with the slow cleanse. But if you do a liver flush, there will be diarrhea. I understand your position and I don't want to make a huge mess first, so i will start slow by doing a cleanse for a couple weeks and if I feel brave afterwards then I will try the flush. thanks vintage, for your help with this. You’re so welcome, sam. If you get near doing a liver flush, we can exchange contact info via PM. I’ll “coach” you. There are clinics that take clients through a liver flush,...must be nice to be able to afford their services. This guy is cute and upbeat. Let him tell you about it. And he gives a “schedule” below his video. P.S. Here is a collection of many, many testimonials. P.S.S. Oh, and here somebody says that liver impairment causes swollen tissue.